The rain from yesterday left sunshine and a bit of a chill in the air. We decided to grab our soil, seeds and pots and throw down a blanket on the deck for a little herb planting session! 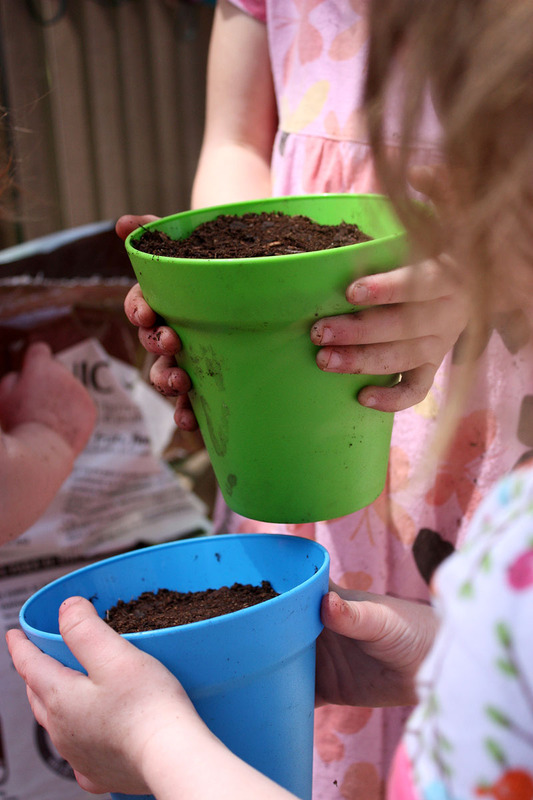 They filled their pots with soil using the new shovels that Grandma had gifted the twins for their birthday! I do have a real grown-up garden shovel somewhere but it got lost sometime between Sophia digging up earthworms under the slide last week and her recently trying to plant every apple seed she got from her lunches in our backyard. The day was sunny but very windy. Sophia giggled that maybe our seeds would blow away while we were planting them! The twins helped each other with their pots, taking turns so they each got to fill one. Isabella said to Grace, "I hold it you, Gracie...okay?" 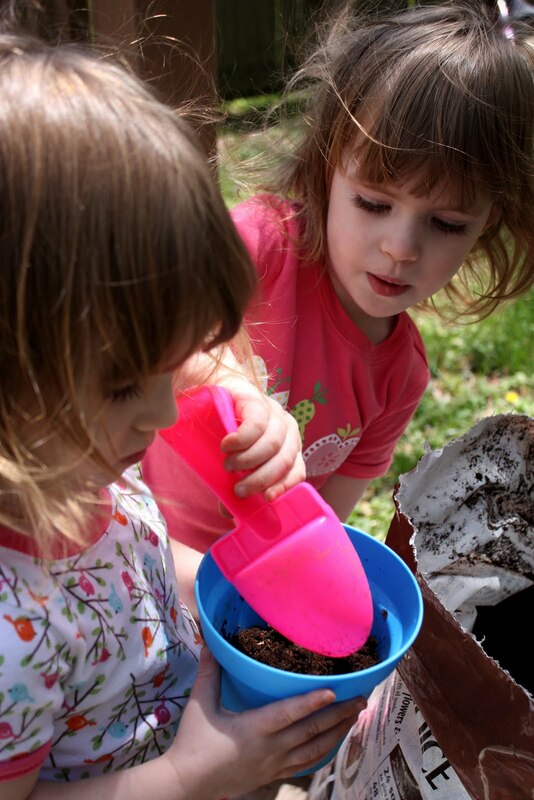 Then they carefully took their filled pots back to the blanket, choosing which herbs they wanted to plant. I was a bit disorganized with all three girls planting at the same time that we forgot which herb went in each pot! I guess we will just have to identify them once they start growing! 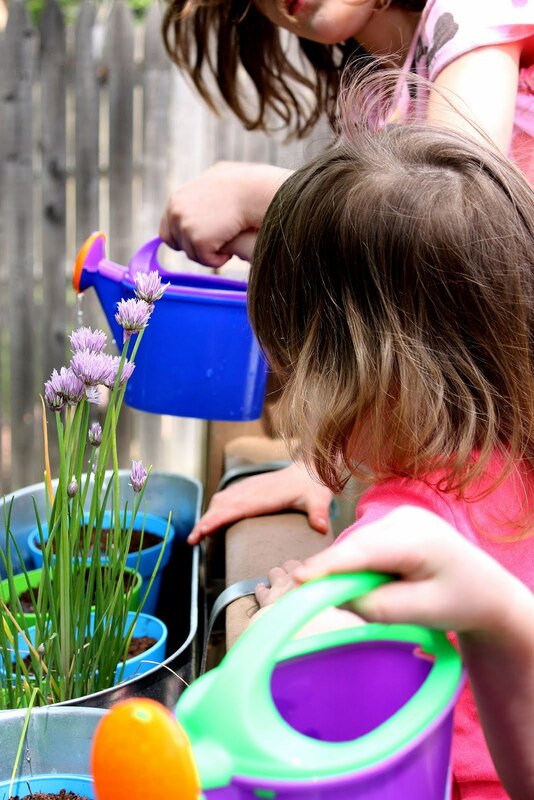 With their seeds planted, they carried their pots to the planter on the deck railing. Then, with their tiny cans filled, they made sure the thirsty seeds got some water! We already have new chives growing from last year's pot that I never emptied! Yea! Oh, and what did Sophia consider the perfect outfit for herb planting today? 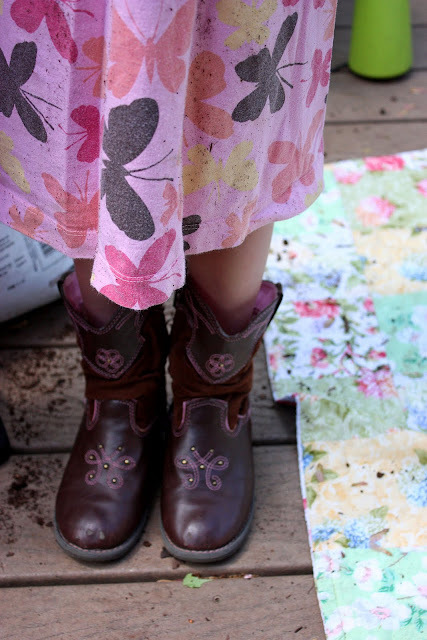 A dress and her cowboy boots... of course!